Welcome to week 2 of our fall family dinner series brought to you by Brewers Organics! What is Brewers Organics? 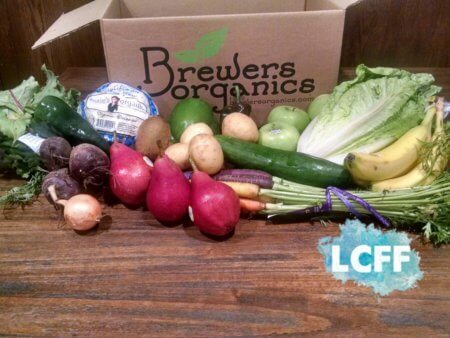 Brewers Organics is an organic produce delivery service company based out of Milwaukee, WI. They not only deliver organic produce right to your front door, but they also have a shop full of Wisconsin products – milk, eggs, meat, and cheese. When you go into their shop, you will find flour, fettucine, coffee, and tea, among many other products, even chocolate! All orders are completely customizable, and there are no commitments. Also, Brewers Organics not only delivers to the Milwaukee and Lake Country area, but they also deliver to the Madison and Fox Valley (Appleton, WI) area. So, if you have friends or family living near Madison or Appleton, pass this along to them! Many thanks to Chelsea Gloeckner with Victae.com, who does all the recipe planning with Brewers Organics and focuses on simple, healthy meals. Chelsea prepared the following recipe for our Lake Country Family Fun readers to enjoy with their families. Please find a code specifically for our readers at the bottom of the recipe to receive $15 off your first produce order! Brining your pork before grilling will yield an incredibly juicy chop! You rinse the brine off before grilling, so do not be alarmed by the amount of salt and sugar used. Give this a try the next time you make pork chops for dinner – gone will be the days of tough and dry chops, something you definitely want to avoid, and now quickly can. This well-balanced nutritious dinner serves a family of 4. 1. 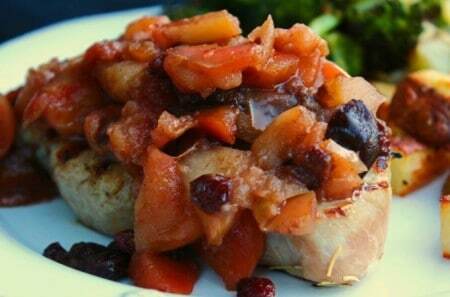 Place pork chops on a plate. 2. In a small bowl, combine rosemary, salt, and brown sugar. 3. Massage the salt mixture onto both sides of the pork chops. 4. Allow pork chops to brine for 15-30 minutes. 5. Rinse the salt mixture off of the pork chops, and then blot each side dry. 6. Heat oiled grill over medium heat. 7. Grill pork chops for 4 minutes on each side. 1. In a fry pan over medium heat, melt butter. Add diced apples and sauté for 5 minutes. 2. Add remaining ingredients and stir until evenly distributed throughout pan. 3. Lower heat, cover with lid, and simmer until the rest of dinner is complete. 1. Roast at 400˚ F for 25 minutes. 2. Flip, and then continue roasting for an additional 20 minutes. 1. Roast at 400˚ F for 20 minutes. To serve dinner, spoon chutney over tender pork chops alongside the roasted potatoes and broccoli. Are you hungry yet? Enter the code LCFF16 at sign up to receive $15 off your first produce order. Find last week’s recipe here. This looks like a great dinner for fall. Thanks for posting it!